The snow was falling outside on Saturday but the action was hot inside Mishawaka High School as the wrestling teams from the Northern Indiana Conference competed for the NIC Championship. The Adams wrestling team had wrestlers in 8 of the 14 weight classes. As a team the Eagles finishes in 10th place with 59 points. At the 220 pound weight class, Jonathan Thomas finished as the conference champion. Thomas had a bye in the first round and won by fall in the quarterfinals in 45 seconds. In the semifinals Thomas won by a fall again at 1:10. In the championship match, Thomas took on Adam Berta of Penn High School. Going through all three periods, Thomas won by decision 8-4 to be crowned the NIC Champion. Thomas’ record for the year improves to an impressive 26-2. Dominique Clark finished in 4th place wrestling at 152 pounds. Clark had a bye in the first round and then won by major decision 7-0 in the quarterfinals. Clark lost however by major decision in the semifinals 9-1. 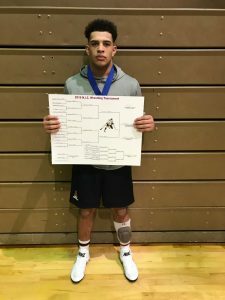 He then moved through the consolation bracket, winning in the semifinals of the bracket in sudden death 6-4, advancing to the third place match. Clark lost the match, getting pinned by Nate Dibley of Elkhart Central, earning him fourth place. Horrace Hill also placed for the Eagles, finishing 5th at 195 pounds. Hill won his first two matches of the day in the opening round and quarterfinals by decision 6-1 and 9-6 respectively. In the semifinals Hill was pinned, moving him to the consolation bracket. There Hill lost in the semifinals by decision 3-2 but he did win in the 5th place match 6-0 over Aaron Martinez of Jimtown. Wrestling at heavyweight Joe Phillips won in the opening round but lost his next two matches. Camden Hanks finished 1-2 for the day as well for Adams wrestling at 170 pounds. John Burford at 132 pounds, Jacob Harsh at 138 pounds, and Chykeem Crawford at 182 pounds all finished 0-2. The team has a few days off before a busy week next week in further NIC action. Adams travels to Mishawaka Marian on Tuesday and Penn on Thursday to finish off the season before the IHSAA Tournament at the end of the month.